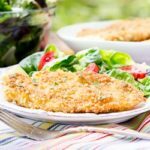 These Peanut Chicken Cutlets have a crispy, crunchy crust made of panko breadcrumbs and chopped peanuts. They cook in minutes for a speedy weeknight meal. Heat oven to 200°F. Place a wire rack in a jelly-roll or sheet pan. Place each cutlet in a large heavy-duty plastic zip top bag or between sheets of heavy-duty plastic wrap. Use a rolling pin or the flat side of a meat mallet to flatten cutlets to 1/4-inch thickness. Lightly season the cutlets with salt and pepper. Set up a breading station with 3 containers. Make sure the containers are wide enough for the cutlets. Place flour in one and eggs in another. Combine breadcrumbs and peanuts in the remaining container. Dredge one cutlet in the flour and shake off the excess. Dip cutlet in eggs to coat completely. Dredge cutlet in breadcrumb mixture, pressing to adhere and fully coat, then shake off the excess. Repeat process with remaining cutlets. In a large non-stick saute pan or skillet, add 1 to 2 tablespoons of butter and some olive oil. You only want a thin layer of oil/butter (enough to cover the bottom of the pan). Heat the butter and oil over medium-high heat. You can test to see if it is hot enough by dropping some breadcrumbs in the pan and if it sizzles it is ready. Cook half of the cutlets for 3 minutes on each side, until lightly browned on both sides and cooked through. Transfer cooked cutlets to wire rack and place in the oven to keep warm while cooking remaining cutlets. Cook remaining cutlets, adding more butter and oil to the pan if needed.